Heman Chong, The Mysterious Island, 2016, wood, plastic, iron wire, silk, paint. Installation view. A light box installed on the Rockbund Art Museum’s exterior, featuring the neon text ONE THOUSAND AND ONE NIGHTS in Arabic, English, and Chinese (all works 2016), serves as a prelude to Heman Chong’s exhibition “Ifs, Ands, or Buts.” Prior to entering the museum, the viewer may also notice a disclaimer written on a nearby billboard: THE STORY, ALL NAMES, CHARACTERS AND INCIDENTS PORTRAYED IN THIS EXHIBITION ARE FICTITIOUS. This is, perhaps, a tribute to Samuel Beckett; I was reminded of the playwright’s note that opens his 1965 film Film: NO TRUTH VALUE ATTACHES TO THE ABOVE, REGARDED AS OF MERELY STRUCTURAL AND DRAMATIC CONVENIENCE. 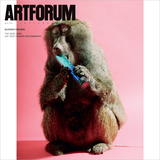 Similarly befuddling is the show’s e-flux announcement, an elusive and nonsensical story about a gossip column called “Papaya Daily.” Chong’s exhibition plays up the ambiguities between reality and fiction, offering seven newly commissioned and genre-spanning works, each seemingly representing the pursuit of an unattainable utopia. Escapism may be a passive approach to dealing with the tedious and sometimes dystopic aspects of everyday life, but who isn’t guilty of seeking the nearest exit for a moment of liberation? Re-Re-Re-Run is a two-channel video installation that pairs two looping videosone that plays the entire television series Mr. Bean and another that screens Wile E. Coyote and Road Runner cartoonson a wall-size LCD screen, along with a deafening sound track. The juxtaposition of these examples of British and American pop culture has little relevance beyond emphasizing the homogenously mind-numbing effect of entertainmentutopia as distraction. The Mysterious Island shares a title with Jules Verne’s 1874 sci-fi classic, in which a group of castaways navigate a dangerous uncharted island. 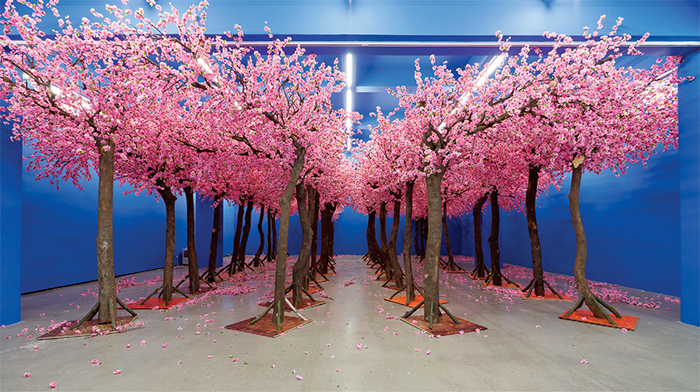 Chong translated Verne’s landscape into an installation of plastic peach trees in blossom, a reference to the reclusive Han-dynasty poet Tao Yuanming, who wrote “Taohuayuan ji”(The Record of Peach Blossom Spring, 421 CE). The titular term has become a synonym for utopia. The orchard is backdropped by walls painted the chroma-key blue of film sets, such that this utopia might be superimposed over another. This fabricated scenea cultural intersectionencourages the viewer to assume a role in an unwritten script, but the portentousness of Chong’s title suggests there is also a dark side to stealing away. In the installation Endless (Nights), ten thousand blank sheets of newsprint cut to the dimensions of the Straits Times, the most popular newspaper in the artist’s native Singapore, form a fortresslike stack in the museum’s dimly lit atrium. Chong allows the viewer to deconstruct this sculptural pile, so that the viewer might symbolically dismantle the ubiquitous and propagandistic white noise of the media. For the work Legal Bookshop (Shanghai), Chong similarly relinquished his authorial control. He hired Kenneth Liu, an intellectual property litigator and sci-fi writer, to draft a list of books related to the legal system in China. Assembled without any input from the artist, curator, or institution, Liu’s compilation, exhibited in a pop-up bookshop that replaces the museum gift shop, comprises a significant selection of fiction and textbooks exploring, specifically, the contingency of law. Another work exploring contingency is the performance Everything Baike, for which the artist asked a group of individuals to read the fifth link posted on the website Baidu Baike (Encyclopedia), which functions like Wikipedia, on each day of the exhibition’s run. The website is censored by the state, a condition that brings to the fore tensions between power and truthhere, omissions contribute to fictions that are often disseminated as truths. The readers’ voices, amplified as they reverberate through the museum’s atrium, assert subjectivity as a critical aspect of knowledge. “Ifs, Ands, or Buts” is a series of grammatical conjunctions. Chong’s works likewise serve as points of connection and postulations. He offers paradoxical scenarios, situations, and fabrications through which one can discover his or her own truth.